The progressive discount shown in the price list is only valid for pre-paid, continuous rentals. Customers with pre-paid reservations have first priority when choosing equipment. There is no refund for unused rental time. The equipment can only be used by the person who is renting it. Foil add 40%, Clients can swap between Foil equipment and Regular Boards and Rigs. Foil Upgrade Package add $120 USD per week for 4 hour use on Foil. The person renting the gear is responsible for any damages. Board and sail damages that can be repaired will be charged for the repair. Damages that cannot be repaired client will be charged the cost to replace equipment. Repair and replacement costs are posted at the center. A Security Deposit: A credit card imprint is required for rental of equipment. The card must have a minimum of US$250 available on it. There is an accident and damage insurance available for purchase upon arrival at center, Contact us for more info. Rates are for 1 board and 2 sails, Storage MUST BE BOOKED prior to arrival to confirm availability. Radical Sports is not responsible for any damage to Stored Material. Entrance Pass will be included in week blocks of storage. Contact us in advance if you need assistance to get your Material to the Windsurfing Center. We Carry mostly Gear from Neil Pryde and JP Austrailia but also Fanatic and North. Boards from 86 Liter to 195 Liter with Full Beginner and Kids Rigs available. Foil Gear by JP Austrailia and Neil Pryde. 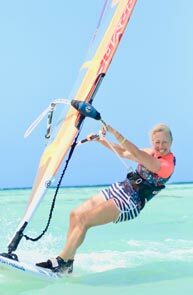 Windsurfing is an AMAZING sport. The best part is that you can Learn the basics and be on the board in only 1 hour with an instructor. 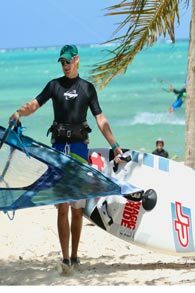 With the warm waters of the Caribbean, Tobago's steady trade winds and our fun instructors your really setup for success at Radical Sports Tobago. 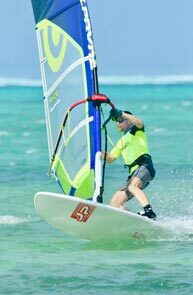 The Taster is perfect for complete beginners where you learn the fundamentals of how to sail a beginner windsurf board and put that into practice on your first lesson. Our shallow water makes it fun and enjoyable. Low tide is the best as the water is flat and its easier to pilot the gear. Like all sports this is just the beginning of your progression but it will also allow you to return and rent beginner gear until your ready for your next lesson. Its best to take a block of lessons. We offer Private, 4 hour Group and 10 hour boot Camp (5 hours supervised training + 5 hours unsupervised practical training in 3 days). Private and 4 hour Lesson options do not include material rental. The 10 hour boot camp beginner Course will be taught on Beginner Material only(Dacron Sails and 220 Liter board).